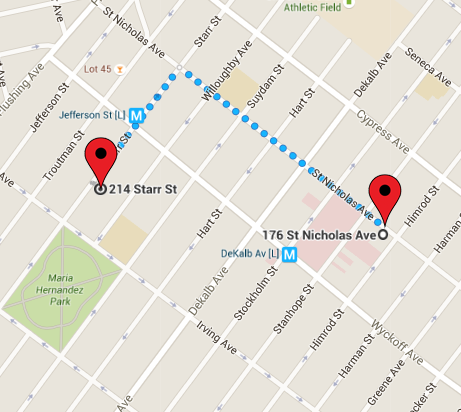 Mayday Community Space is located within a shared 3-story building at 176 St. Nicholas Avenue in Bushwick, Brooklyn. It is home to two Episcopal congregations, the Bushwick Abbey (services in English) and Iglesia Santa Cruz (services in Spanish). Take a look at the various spaces available for creating, conspiring and celebrating. When you’re ready, fill out this form and let us know how you would like to use the space. The ground floor Build Room is the perfect place to host your group meetings, trainings, art builds and more. The 700 sq ft room is shared with the People’s Climate Arts, a collective that partners with grassroots orgs and activists to make visuals for social justice movements. It features a separate cozy kitchen and is accessible by wheelchair. Three sunny rooms ideal for small to medium-sized trainings, classes, meetings and workshops. The larger classroom is 540 sq ft, the green and pink classrooms are both 250 sq ft. You can book one of these rooms or reserve the entire 2nd floor. The Great Hall is a stunning 2700 sq ft space with hardwood floors and seating of up to 200 people. It comes with a raised stage (22 ft x 12.5 ft), audio and visual equipment and an adjoining large kitchen. Perfect for big gatherings, performances, dance classes, fundraisers and more.